The Republic of Ecuador is one of the smallest countries in South America, bordering Colombia in the north and Peru in the southeast. Ecuador's capital of Quito, officially called “San Francisco de Quito”, is located high in the Andes at an altitude of approximately 2,800 meters, making it the highest official capital in the world. Its historical centre divides the northern from the southern part of this long-stretched city and was one of the first city centres to be included in the UNESCO World Heritage List. Catholic churches, one even more beautiful than the other, determine the streetscape of colonial Quito with a clear Spanish influence. Ecuador's capital is the second largest city of the country, after the coastal city of Guayaquil. Because of its large harbor, Guayaquil is the main trading city, especially for important export products like bananas, shrimps, and canned tuna. Nevertheless, Quito is Ecuador financial and political center, along with a growing flower industry due to many rose plantations located in north of the country. Another important industry in Quito is tourism. The capital is the port for tourists entering the country, whether they come to explore the mainland or to visit the Galapagos Islands. 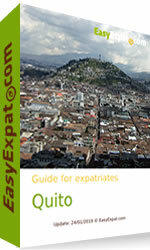 You can also discuss and share experience about Quito and Ecuador in our forum.